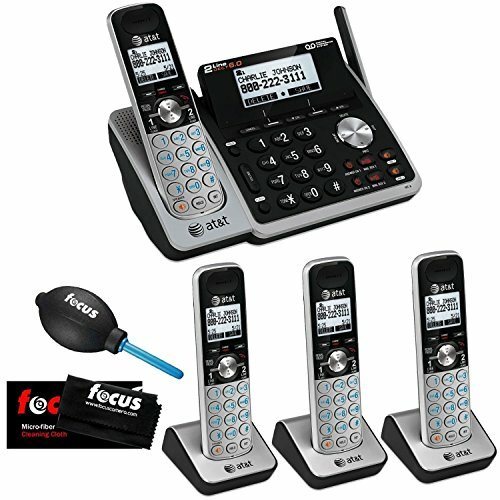 An efficient home-office epicenter, this 2-line cordless telephone system allows incoming and outgoing calls on separate lines, giving you the flexibility to manage professional and personal business at once. A distinct mailbox for each line makes it easy to stay organized. Advances in noise-filtering technology and a unique antenna design provide Unsurpassed Range so you can roam away from the base and enjoy crystal-clear clarity. Speakerphones on the base and handset make hands-free communication easy. Plus, the Caller ID stores up to 50 calls, shown on a large tilt base display-so you know exactly who gave you a ring, and when. Intercom, call-transfer and conference capabilities streamline in-home communication and eliminate disruptive shouting through the home. The telephone uses DECT 6.0 Digital technology, which delivers exceptional sound quality and security, while ensuring wireless networks and electronic devices don’t interfere with conversations. The TL88102 is expandable to 12 handsets.